Babies need constant attention — they require constant feedings and diaper changes, and they require them at all hours. Tending to a baby is a full-time job, so it’s no big surprise when dishes start piling up and you’re running out of clean baby bibs. Less clutter in your home will help you keep your sanity. Get your partner or a friend to help you sort through, store or get rid of things you no longer need. Having fewer objects in the house means fewer items to be dusted, wiped, polished, picked up and rearranged. Invest in a sling. 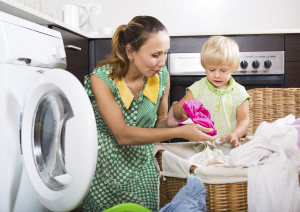 With your baby in a sling or other carrier, your hands will be free to fold laundry, dust and vacuum. As the baby gets older and you are able to do more activities outside of the house, the sling will also help you carry your baby through stores and other areas. Take advantage of naps. It’s certainly okay to sneak in a few chores while your baby sleeps. But if you’re exhausted, listen to your body and use the time to catch a few winks yourself. stress out too much. Twenty years from now, what will you regret more — letting laundry pile up or neglecting to spend enough time with your baby? Your health and the baby’s needs come first. Besides, if you think your home’s messy with a new baby, just imagine how it’s going to look with a teenager!